— A floating filter that skims the surface, adjusting to the height of the water. Enjoy the healing effects of hot tub hydrotherapy in your own home. Strong Spa’s hot tub hydrotherapy jets speed the body’s own natural healing processes while improving circulation and decreasing joint pain. Strong Spa’s hydrotherapy jets are designed for maximum hydrotherapeutic benefits with dedicated neck & shoulder jets, pulsators and spinners to isolate and massage the areas where most people carry tension. Each Strong spa is fitted with fully adjustable Waterway™ jets, which allow you to control the pressure and direction of the flow to relieve stress and muscle fatigue. All Strong Hot Tubs are built with the highest quality components, unlike some of our competitors who use less reliable overseas parts to save on costs. Reliable high output Waterway pumps deliver an invigorating massage. All our hot tubs are controlled electronically using state-of-the-art, user-friendly Balboa electronics – the standard in the hot tub industry. Powerful yet efficient heaters ensure your hot tub is kept warm even in the harshest of winters. Quality high-density insulation ensures your operating costs are kept low. All our hot tubs have to pass a very stringent testing process, which includes a full water test, electronic diagnosis as well as an intense visual inspection prior to leaving our factory. The interiors of our hot tubs feature ergonomic multi-level seating with consideration for people of all sizes. Recessed jets in seating areas of our hot tubs ensure comfort. Sleek flowing lines create a stylish environment with maximum tranquility and relaxation. 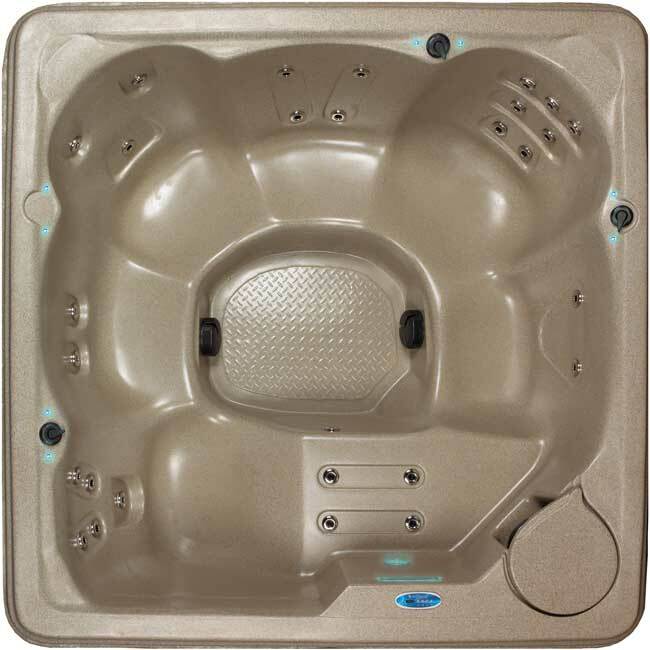 The exteriors of our hot tubs consist of robust unibody cabinets, which are nearly indestructible. These cabinets require absolutely no maintenance and are UV protected so they will never fade or discolor over time. For the first time ever, Strong Spas is guaranteeing the comfort and performance of its product in the first 90 days of ownership or we will return the spa and refund the purchase price (see our Return Policy for details). We will do our best to fulfill and exceed your expectations. If you are not fully satisfied with your purchase, start by talking to our no-hassle team. We’ll do our best to resolve your issues and concerns, and if you’re still not satisfied, we’ll take the spa back and give you a full refund*. We care about our customers, so we’re providing the industry’s first 100% satisfaction guarantee. Strong® Spas has a network of local hot tub dealers and technicians already set up to provide you with all the support you need to enjoy your hot tub for a lifetime! We have connections with certified hot tub repairmen and technicians near you. Having a problem with your spa or hot tub? Contact our No-Hassle Team and we’ll send someone to you right away. Have questions about operating your hot tub or what’s covered under your warranty? Our national service network can help with that too. Our extensive connections allow you less downtime and no headaches. It’s easy to get the support you need, when and where you want. We guarantee your satisfaction. Hot tub lighting plays an integral role in creating your ideal evening environment. Set the desired mood with the push of a button, activating our advanced LED lighting system. Scroll through the various colors and or sequences to change the atmosphere from romantic sensual to party scene. Select models even include multi-points of light and a soothing back-lit waterfall. * Our LED (light-emitting diode) technology consumes less energy than incandescent lights, creates richer colors without having to change bulbs or color plates. HydroDrive flow technology for Strong Hot Tubs was designed by our own engineers to increase water flow for a more vigorous massage experience, while reducing electrical consumption of the hot tub pumps. Our engineers achieved this by increasing the size and adjusting the angle of the pump impellers; and by optimizing internal plumbing, jet placement and jet configuration. The results are a difference you can feel when you’re in a Strong Hot Tub. Titan™ Hot Tub HardCovers Designed to Last a Lifetime! They don’t get any stronger than this. Our unique hot tub hard cover was engineered to provide the toughest protection and ultimate thermal efficiency. The locking cover can hold well over 2,000 pounds, minimizing the risk of kids or pets entering or drowning. It’s easy for an adult to open, but not a child. The key locking cover also protects spa controls and stereo systems from theft. In addition, our hot tub cover is fully insulated with closed cell foam to keep the cold out and the heat in. Titan™ keeps your hot tub clean and ready to go. Barrier free seating with no obstacles. Provides easy movement within the spa from one seat to the next.